KUWAIT CITY, April 14, (Agencies): President and members of Kuwait Football Association (KFA) held talks with visiting FIFA President Gianni Infantino Saturday on means of developing football in Kuwait. The two sides also discussed a host of issues over the development of football, a KFA statement said. The meeting was attended by KFA President Sheikh Ahmad Yusuf Al-Sabah, Vice-President Ahmad Oqla Al-Enezi, and members Sabeeh Abul, Ahmad Ajab, Khaled Al-Shemmeri, Ibrahim Al-Ansari, Fatma Hayat, Salem Saadoun and Mohammad Khalil. 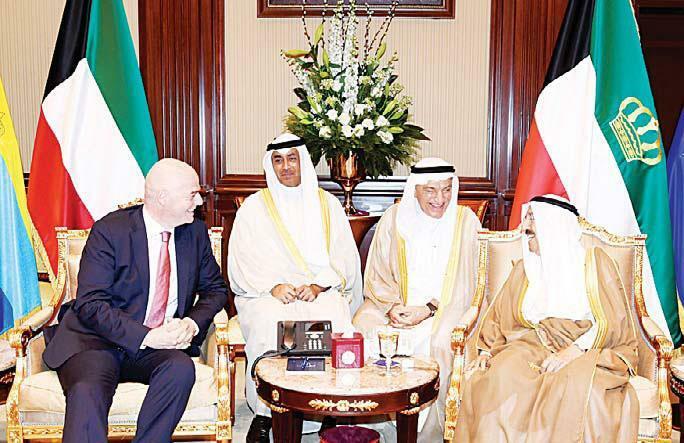 Infantino arrived in Kuwait earlier Saturday for a two-day visit. HH the Amir Sheikh Sabah Al-Ahmad received at the Bayan Palace Sunday morning Infantino and Sheikh Ahmed Al-Yousef on the occasion of his visit to the country, reports Al-Rai daily. On the other hand, Kuwait's share in hosting a number of World Cup 2022 football matches in Qatar seem to have beaten the retreat, to the extent that it is described as 'very weak' by a source close to the file. The picture appeared to pale despite the 'surprise' visit initiated by the President of the International Federation (FIFA) Swiss Gianni Infantino to Kuwait Saturday morning, and was kept secret, perhaps in preparation for a final decision on whether Kuwait will host or not a number of games since the negotiations in this regard has been ongoing for quite some time. After the atmosphere fluctuated between positive and negative, the 'balance of the World Cup' began to take a curve towards the departure of the World Cup from Kuwait, for several reasons, most notably, as reported by the source, is the apology of the Sultanate of Oman for its inability to co-host in the 'global festival' due to shortage of time for completion of preparations. The same source said that the Kuwaiti optimism took more than it deserved, especially that the issue of hosting will not enter the framework of concrete reality if the tournament is not expanded to 48 teams, a decision which is likely to be taken on June 5 in Paris.